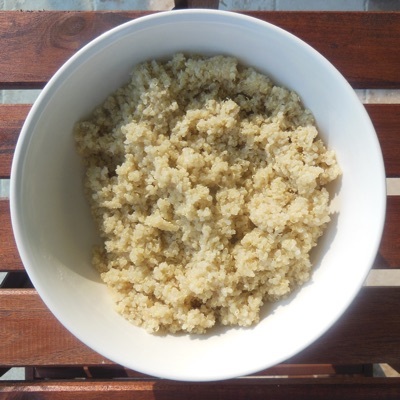 Thoroughly rinse quinoa until water runs clear, otherwise it could taste bitter. Place quinoa in a pot. Add water, double the amount of quinoa you used or enough to cover by 2 inches and 1 TSP of salt. Immediately once water starts boiling bring heat down to medium for a simmer. Cook for 12-15 minutes. It's ready once all water is absorbed and quinoa expands. Remove from heat and let it sit for 5 minutes so it dries out.